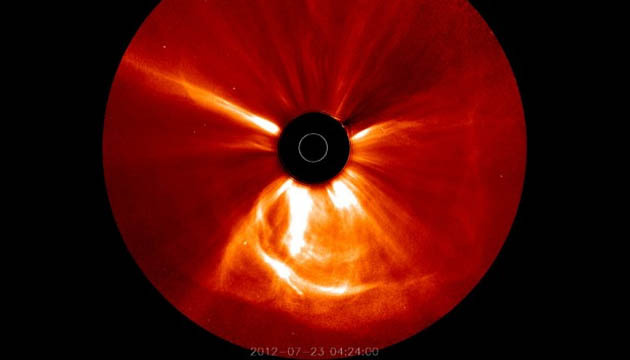 On July 22, 2012, a solar Coronal Mass Ejection (CME) of possibly the greatest recorded strength in history blasted by Earth's orbit at a speed of 3000 kilometers per second, four times faster than a typical CME. Had it impacted Earth's protective magnetic field, we could have experienced major disruptions in communication, brilliant aurora displays at tropical latitudes, damage to orbital satellites and possibly even major power blackouts. Fortunately, the shot only crossed our bow and flew harmlessly into space. July 2012 may sound like ancient history, but we can take this story as a reminder that today the sun is still riding the same high of solar activity that fueled this super-storm, and that it serves us well to keep our eye on that big orb in the sky. The eruption was detected and tracked by NASA's twin STEREO spacecraft and the European Space Agency's SOHO satellite. By observing the high-speed mega-bubble of ionized gas from three different vantage points, STEREO and SOHO scientists were able to very accurately triangulate its speed and direction and also formulate an explanation for why this CME was so much faster than ordinary. It appears that the path of this super-CME was cleared out by another CME that preceded it only 10 to 15 minutes earlier. This had the effect of clearing the plasma and straightening the magnetic field of the normal ubiquitous solar wind, allowing the second CME to travel more freely—maybe similar to how a bicyclist following in the wake of a truck encounters less wind resistance and can move faster than normal. Solar flares and CMEs usually pass unnoticed by those not using high-tech telescopes and sensors on space-based observatories. Even when a CME impacts the Earth, its effects are mostly invisible in our daily experience. But occasionally we get a reminder that the sun is not merely a quietly glowing ball that warmly imparts the energy that sustains life on Earth. Energy generated by nuclear fusion in the sun's core constantly flows outward through the sun's layers and into space, most benignly as sunlight. But some of that energy generates powerful magnetic fields that build up in locations on the sun's surface and atmosphere. Just as when a rubber band breaks when twisted too tightly, the wound-up magnetic fields can reach a breaking point and snap. When that happens, we see solar flares that superheat the sun's atmosphere to millions of degrees and send out intense bursts of high-energy X-rays, and CMEs that belch out billions of tons of hydrogen plasma at typical speeds of a million miles an hour. Solar magnetic activity rises and falls over an 11-year period: one solar cycle. At periods of minimal activity the sun is relatively quiet and the telltale markers of magnetic concentrations that we call sunspots are rarely seen for months at a time. We are presently near the peak of activity of a cycle at "solar maximum." The present cycle, number 24, has been less intense than cycles in recent history, with fewer and smaller sunspots and less flare and CME activity. But the epic CME in July 2012 shows us that even a lesser solar maximum can pack a punch on occasion. In fact, it was during another similarly lethargic solar maximum in the 19th Century, that of solar cycle 10, when a major CME did impact the Earth and gave us our first insights into the connection between activity on the sun and its effects on Earth. Named the Carrington Event for the British amateur astronomer, Richard Carrington, who observed and recorded its effects in 1859, it was powerful enough to make its presence known even at a time before the existence of high-tech space telescopes and high energy electromagnetic detectors. Carrington and another observer, Richard Hodgson, independently observed a brilliant solar flare that triggered a high-velocity CME. Eighteen hours later the CME arrived at Earth, firing up the auroras. They are normally only visible at extreme Arctic and Antarctic latitudes, but during this event became visible over much of the Earth -- as far into the tropics as Tahiti and Cuba. The disturbance to Earth's magnetic field induced electrical currents that caused telegraph lines to spark and even set fire to some telegraph offices. Should a super-CME like the Carrington Event or the solar storm of July 2012 strike the Earth today, the results would likely be far more damaging than a few telegraph offices going up in smoke. Today we live in a world far more vulnerable to solar activity; our electronic, wireless, and computerized technologies are sensitive to electrical surges and electromagnetic blasts. We rely on orbital satellites for communication and surveillance, satellites that are at the front lines of any onslaught by a solar storm. Some have estimated the damage that would be caused by a direct impact might total a couple of trillion dollars, 20 times the amount caused by Hurricane Katrina. The good news? We observe the sun and its activity constantly with spacecraft like STEREO that can track CMEs and predict impacts with Earth. So at least we'd have a few hours' warning.